I decided to take 5 minutes to say hi. I had a fantastic time in Transylvania! I have 3 posts to write regarding everything I saw. Unfortunately, it will have to wait until next week. But here is one photo as a teaser! I am very proud of this photo. My friend Richard calls it the "national geographic" photo. 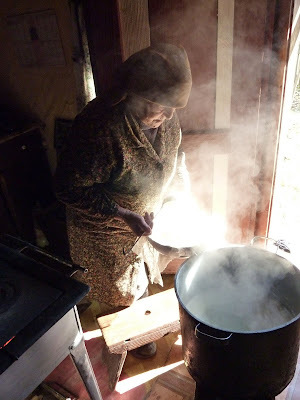 This wonderful women invited us into her home to watch her make cheese. A beautiful woman with a spirit that made me wish I could spend a day with her asking her all about her life. Below are photos of the 1200 notebooks and 500 cards that were delivered this morning!Thank god I am still house sitting as my flat could not hold all these notebooks! I love your work ! Is this going to be sold in Budapest ? (and if it is yes, tell me where !!! ). You will be able to buy some of the notebooks and cards at Rododendren in Budapest. Or call me and we can schedule a meeting at my studio/flat. Mimoza-thanks. My fingers are getting tired! I'll call you after my children's holidays (in one week). Lilibulle - I look forward to meeting you soon!